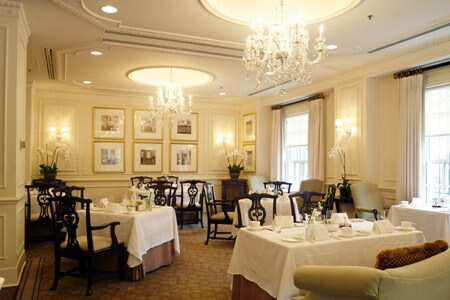 American cuisine served in a formal setting at this Hay-Adams hotel restaurant in downtown DC. About the restaurant & décor: Located in the elegant Hay-Adams hotel across the street from the White House, The Lafayette features uniformed waiters, white tablecloths, a piano player and overhead chandeliers. It also showcases classy cuisine, plated beautifully to catch the eye and supercharge the palate. Food & Drinks: The distinguished seasonal menus can begin your day with bibimpap (a Korean favorite), an oatmeal soufflé or a Chesapeake Bay crab cake Benedict with tempting sides. Lunchtime offerings include entrée salads, seared veal loin or baked Atlantic cod, with appetizers of Spanish octopus or burrata. Dinner brings a foie gras torchon among other starters, followed by entrées such as Angus beef tenderloin, pan-seared scallops and spiced Muscovy duck breast. Executive chef Nicolas Legret is French, so expect to find French overtones in some of the dishes. Be sure to ask the waiter about the wine list. The restaurant's collection is quite distinctive; look for choices like Lake Chalice Sauvignon Blanc and Château Fayan, Puisseguin-Saint-Emilion. The renowned pastry chef delivers a sweet conclusion to main meals with house-spun ice creams, zucchini cakes or a strawberry soufflé. For an after-dinner libation, why not a glass of Château Les Justices Sauternes?